In many Blue builds, Blue Positioning Drill is the engine that powers the entire strategy. The value of targeted discard pile recursion cannot be overstated, and in this instance you have the luxury of stacking the top of your deck. Without taking any other synergistic interactions into account, Blue Positioning Drill (and the use of Blue Protective Mastery) will bring back at least one card per turn. If you’re facing offensive pressure, you can place Endurance on top to slow the bleeding. If you’re in a slower match, you might grab a Setup or Drill to draw on your next turn. If you have effects that allow you to draw a card, then a key attack like Blue Lunge would also be a good candidate. Ultimately, many games are won and lost by the amount of action taking place in the discard pile. An unchecked Blue Positioning Drill can completely turn the tide of a game, so make sure you’re prepared to answer it! Z Warrior Mailbag – Win a Box! 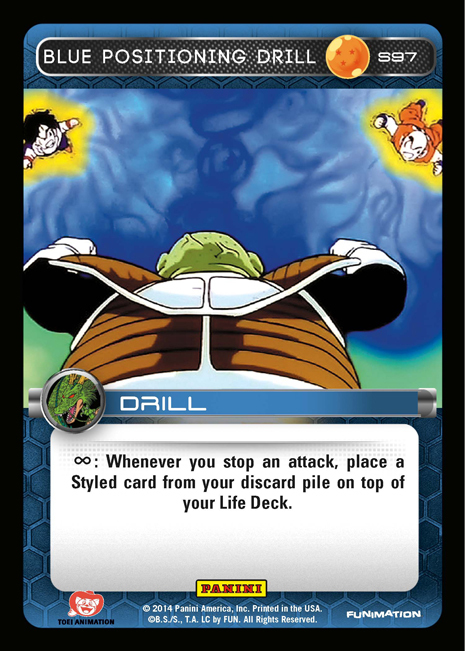 Love this card…especially when I have a few blockades out and can keep stacking them. You can only put styled cards on top, so a no go on the Tool recursion. I do like the Blue Reprimand + DB7 combo though. Drill is to get Reprimand back, Reprimand gets DB7 back, DB7 gets TiaWT back. Amazing card. Any stall/DB deck runs this.